The Pittsburgh Steelers made two roster moves in the run up to the Cleveland Browns game, one which surprised no one, the other which surprised at least some. Swapping Cam Heyward for Bud Dupree really came as no shock, as Bud Dupree has been working with the team for weeks, while Cameron Heyward is lost for the season. But the Steelers also placed wide receiver Markus Wheaton on injured reserve and promoted Daryl Richardson from the practice squad. Let’s be clear, putting Markus Wheaton on injured reserve does not classify as a shock. After injuring his shoulder in the Steelers preseason win over the New Orleans Saints, Wheaton has only appeared in the Steelers loss to the Eagles and in their wins over the Chiefs and Jets. Prior to the Ravens game, the decision to start Darrius Heyward-Bey seemed to indicate dissatisfaction with Wheaton as Todd Haley indicated that Wheaton would have to fight his way back via the scout team. However, Wheaton did not dress for any of the Steelers game since then, and today’s decision suggests Wheaton’s health was holding him back. So the sum total of Markus Wheaton’s 2016 campaign comes down to 5 catches on nine targets for 51 yards and one touchdown. Not a big loss for an offense that just put up 30 points (while missing 4 two point conversions), right? Not so fast. The Steelers losing Markus Wheaton for the rest of 2016 complicates things far more than you might think. 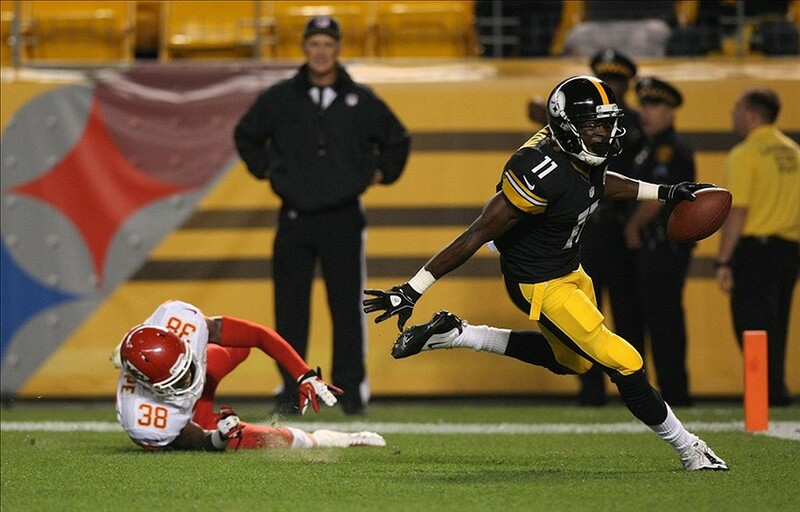 Why the Steelers Losing Markus Wheaton Still Hurts…. Ben Roethlisberger, Antonio Brown and Le’Veon Bell are the pillars to which the success of the 2016 Steelers rest on. As the loss to Dallas made so painfully clear, however, the Steelers need more than the Triplets to win. And honestly, the outcome of the Dallas game probably doesn’t change if you can inject a fully health Markus Wheaton into the lineup. But the Steelers still lack a clear number 2 opposite Antonio Brown. The win over Cincinnati and the loss to Miami revealed that Antonio Brown is in fact mortal. The Steelers need someone who can either make opponents pay a price for triple teaming Brown or alternatively force them to pay attention to him. While Eli Rogers and Cobi Hamilton have done some nice things thus far, neither man has shown he can be that player opposite Brown. Markus Wheaton showed he was capable of taking heat off Brown during the latter half of 2015. With Martavis Bryant suspended, the Steelers had hoped that Sammie Coates would fill his shoes, but Coates has been nursing hand injuries all season and his currently playing with two broken fingers. The Steelers clearly signaled that they wanted Darrius Heyward-Bey to step up to that role, but Heyward-Bey is still in a walking boot. As long as Markus Wheaton was healthy enough to hold a roster spot, there was hope his health would allow him to recover the form and the role role he played in 2015 Steelers offense. With the Steelers losing Markus Wheaton to the injured reserve list for the rest of the season, that door is now shut. This entry was posted in Steelers 2016 Season and tagged Antonio Brown, Ben Roethlisberger, Cobi Hamilton, Darrius Heyward-Bey, Eli Rogers, Le'Veon Bell, Markus Wheaton, Martavis Bryant, Pittsburgh Steelers, Sammie Coates, Steelers vs. Browns, Todd Haley. Bookmark the permalink. Combine this with a D-line that puts limited pressure on a QB and a Defensive back field that can NOT cover, we’re looking at 8 & 8 or possibly a 7 & 9 season…. Yes this does hurt. Losing Bryant was one thing, but I don’t think ANYONE thought that 9 weeks into the season Eli Rogers and Cobi Hamilton would be rotating as the Steelers number 2 WR. Injuries continue to take their toll.